Hearing... the furnace going... brrrr! Pondering... the urge to clean up, clear out, and eliminate more stuff. I'll start with just picking up my office... time to put the sewing things away for awhile. Praying... for my four pregnant friends, one of whom could deliver any day, now! Thankful... for so many good and faithful friends from our little chapel. Wearing... (did I mention it's COLD?) Jeans, long-sleeve red t-shirt, navy sweater, socks and slippers. Going... to pick up Wyatt from school, in a bit. Too wet and cold to ride his bike today. Reading... about to start Song of Saigon, by Anh Vu Sawyer. Looking forward to... a wedding on Thursday! We are joyfully celebrating these two young-ish church friends joining their lives together. * keeping track of times and dates - wedding, Wyatt's job (only one day a week), an evening out with my mom and sister, planning Mother's Day here, how long until DISNEY, etc. One of my favorite things... fresh tulips. You have made your way around this hill country long enough; now turn north. 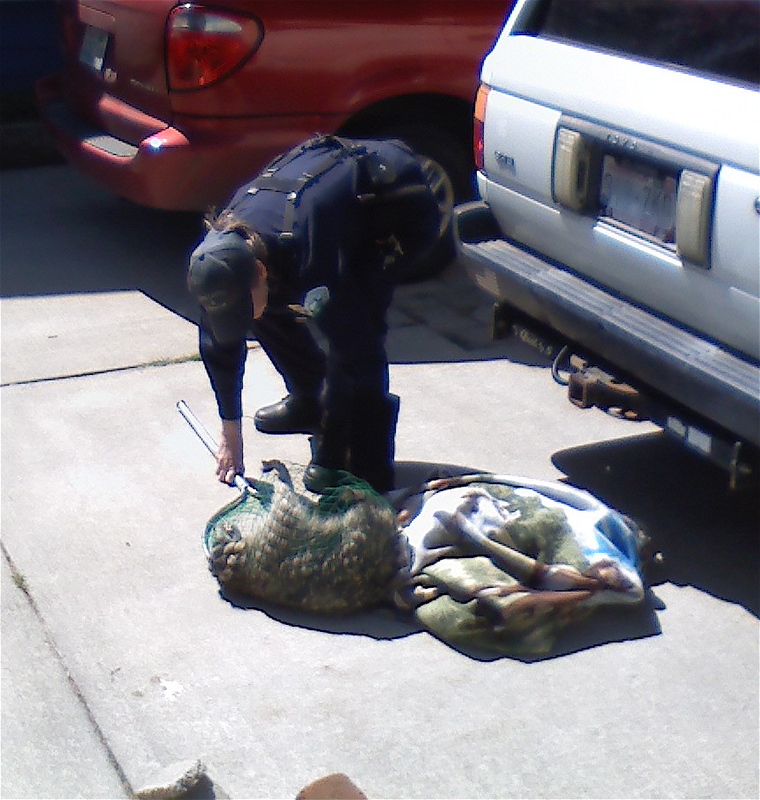 A peek into my world... Kerry snapped a cel-pic last week, of animal control coming after the mad raccoon - yikes! Nope, we're not raising them to be professional whiners. 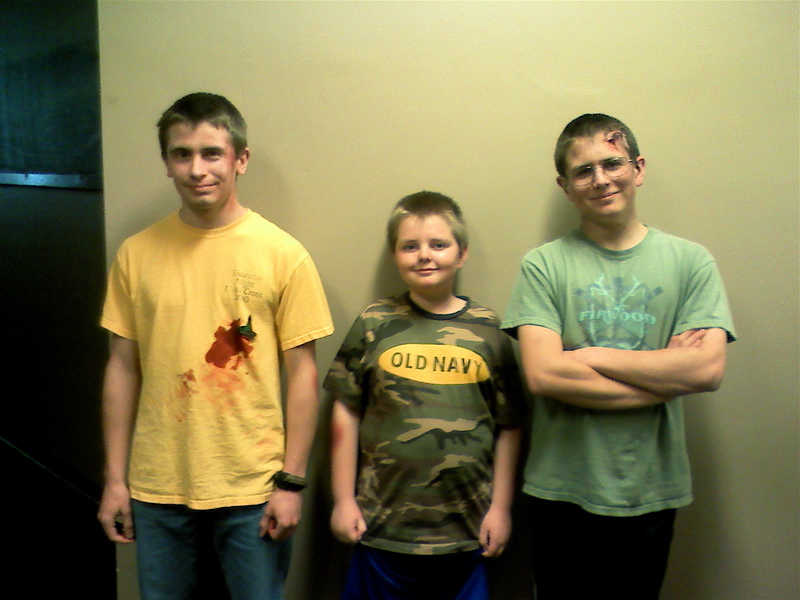 They were over-the-moon excited to volunteer to pose as victims for a local CERT class' (Community Emergency Response Team) final exam. 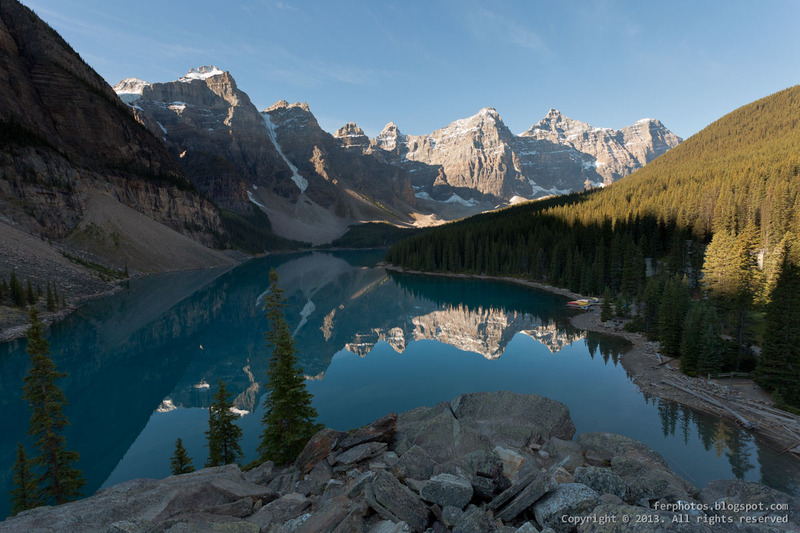 Given our location on the Pacific Rim, the scenario is often an earthquake. 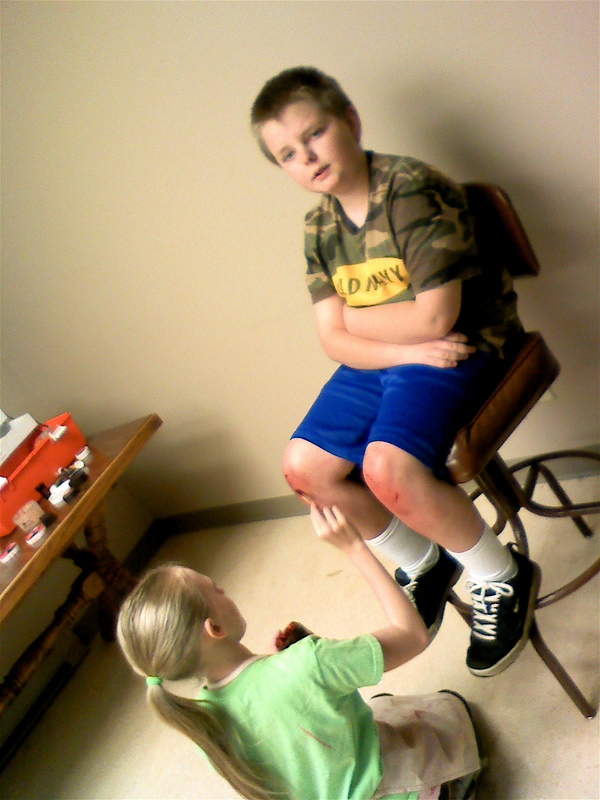 The students have a time frame in which they are supposed to locate all the victims, triage them, and treat as many as possible. Wyatt and Tate have been on the other side of this, with their Search and Rescue training, so it was a lot of fun for them. And Gunnar was thrilled to be allowed to participate, too. In fact, they had several kids acting as victims. So - warning! - avert your eyes if you're squeamish! Don't these guys look kind of happy to be sporting injuries like those? The students are supposed to triage the victims into four classes. Green victims have non-life threatening injuries and can wait. 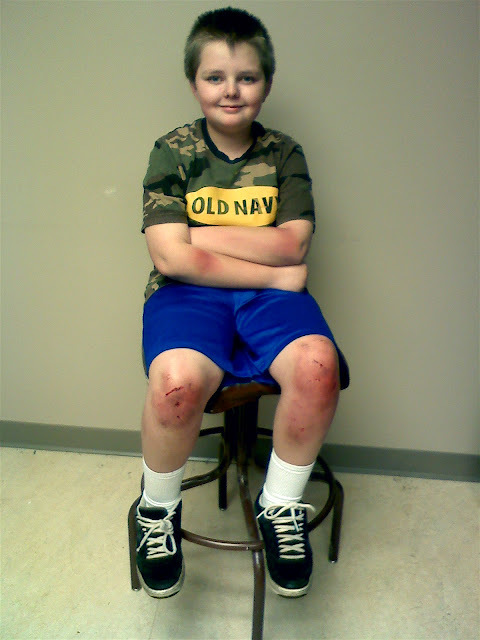 Gunnar was a green victim - scrapes, minor cuts, and bruises. He got a blanket and a pat on the head (comfort). Red victims have immediately life-threatening injuries and will die soon, if you don't do something. I think Wyatt and Tate were both in the red category. Tate was given a head injury and a concussion and was told to act dazed and disoriented. Wyatt had a large nail embedded in his chest. Black victims are either already dead or mortally wounded, and don't get treated. That sounds cold-hearted, but in an emergency situation with multiple victims, you treat the ones you can help. 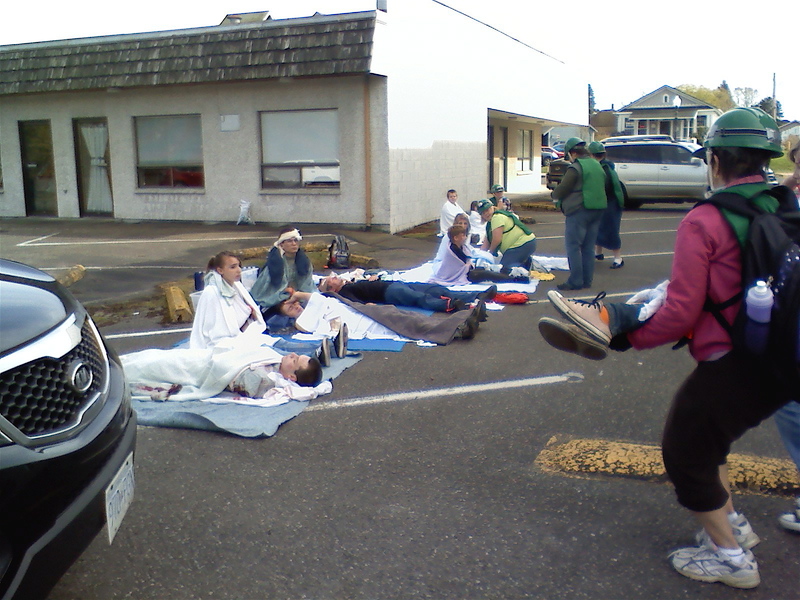 The volunteers/students are in green, and are assembling the victims in a safe area outside the disaster zone. I can see that Tate's head has been bandaged, but I don't see the other boys. Gunnar was way in the back of the building and one of the last victims found, and Wyatt may be covered up at the far end. 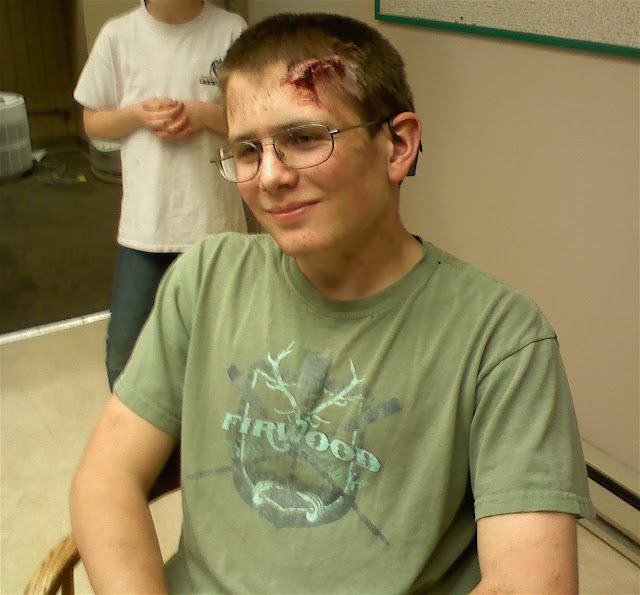 Two moulage artists came and applied the (make-up) injuries to the victims. The boys were a bit surprised by one of them - this girl couldn't have been more than nine or ten, and did an awesome job! She matter-of-factly presented Wyatt with a large nail and a screwdriver and said, "Which would you prefer to be impaled by?" and proceeded to do him up. She also used a chicken bone to effectively simulate a compound fracture. And here she is applying Gunnar's scrapes and bruises. But what made the whole afternoon and evening even more fun (because what could be more fun than looking like you're about to die, right?) was that the boys went straight from the CERT class to... youthgroup! Things come in threes, right? 1. Not really that weird... at least for where we live. Yes, that is snow on the hill in the distance. 2. Gunnar lost a tooth at lunch. While losing teeth may be normal, Gunnar rarely loses his in a normal fashion. He claims he's like an oak tree. Other trees lose their leaves in the fall, in a blaze of glory. But the oak tree clings to its leaves until new growth in the spring pushes the old leaves off. Gunnar lets his teeth hang on FOR-EH-VAH. Leading to episodes like this. This time he thought there was something in his lunch that shouldn't be there. There was. A molar. His molar. Which he promptly spit out onto the plate. 3. We caught a raccoon. So yesterday we were getting ready for church and noticed a raccoon in the yard across the street. He seemed to be chasing his tail, like a puppy. A very slow puppy. Maybe he was young and playful, but whatever, we needed to get out the door. Well today he showed up in our driveway. Normal raccoons will run away and go up a tree, but this one... not so much. He just stayed in the driveway with all of us watching him twirl in slow circles. While Kerry found the whole thing amusing, I grabbed a laundry basket. The boys and I distracted the raccoon while my dad came around behind him, dropped the laundry basket over him, and held it down with his foot while Tate grabbed a cinder block to weigh it down. Sorry, I was too distracted to get pictures. Then things got even weirder. You'd think Animal Control would be on this in a flash. I mean, that's their job, right? You'd think so, but you'd be wrong. as we've already learned, and - NEWSFLASH - I'm not willing to transport this addled little animal in my vehicle, thank-you-very-much. They finally relented and came to get it. And - golly gee - realized we'd made an accurate assessment that something was definitely wrong with this one. Probably not rabies, much to my relief. Apparently they're very susceptible to distemper. They get sick. And behave strangely. And they go in circles. Bad news for the raccoon - it's fatal. They'll euthanize it. Good news for us - humans don't get it. Not that any of us got close enough to get bit or scratched, but still... ewwww. Gee, I can't wait to see what the rest of the week brings. Hearing... a quiet house. Wyatt already left on his bike for the high school, Kerry is in his office, Gunnar is sitting in a patch of sunlight reading about Laura and Almanzo, and Tate is no doubt already a third of the way through his school work. Pondering... lots to do this week, and how to make it all happen! Praying... for the friends I mentioned yesterday who lost their son. Thankful... for the unshakeable promise of eternal life, for the boys' hard-working mindset (most of the time), for the freedom to homeschool, and for the brightness of the day. Wearing... sweater, t-shirt, jeans... but WAIT! They're not just jeans, they're capris. Wow! It's a dramatic foray into a new style! Creating... I've been happily sewing for the new babies coming this summer, and now that all my sewing stuff is out I'm motivated to keep going... for me. Going... to gather the boys and "open" our school day together (though Tate is already doing his independent work), to take advantage of the sunshine to dry laundry on the line (especially my sheets, I love sheets dried on the line! ), and to do a bit of tidying of my sewing things so I have space to launch a new project. Reading... very much enjoying Seven Daughters and Seven Sons with the boys! In the kitchen... barley and vegetable soup, made of leftovers from the last couple of days, simmering in the crockpot. Maybe I'll make some home-made bread, and - WA-WAH - dinner. in the learning rooms... hard to keep myself from counting down (three weeks of school before Disney, and four after) because that makes it sound like we're just enduring something, and the year is going quite well, really! We enjoy what we're doing! Tate is about to finish his math book and start Algebra. Gunnar is (finally!) wrapping up a science unit on worms, with an unpleasant focus on parasites... I mean, it's a great science course, but we've both felt the "ew factor" of this last section! Around the house... I'm so tired of people leaving clutter laying around! I've started a box. It's in the mudroom. If you're missing something and you just may have left it lying around then you can go check the box. The Mother Load... oh boy, oh boy, oh boy! Laundry piling up, papers on my desk piling up, and lawn mowing jobs piling up! All good things that need to be managed. Noticing that... All the boys need shoes again... all of them. Something fun to share... ooo, almost! Can't share quilt pics yet, but I like how they came out. One of my favorite things... seeing color again, outside. All winter is gray, brown, and a bit of green. And now, color! That's probably why I have so much color in the house. and there's probably more I'm forgetting! I feel like I've been boggled in circles this week. Kerry and I had to sit down after church today, and have a "calendar summit". The equivalent of synchronizing our watches, yah? It's been a quirky week. We've had some ups and downs. Best news? Kerry is shaving off his beard, right now as I speak. Or write. Whatever. Hallelujah and Amen. 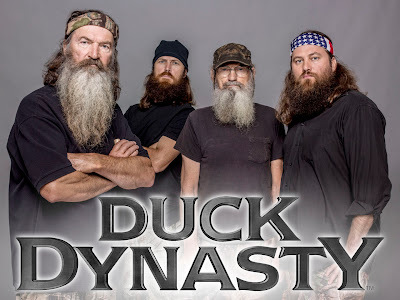 The boys got a phone call from another person who wants to hire them to mow and do yardwork this summer - wa-hoo! My meeting with one of Wyatt's teachers and the school counselor seemed to go well. Everyone has to pull their own wagon, and Wyatt needs to be responsible for Wyatt. However, there were a couple of things about the way the class was being run that were making it much more difficult for him (and perhaps others) that probably needed to be brought up. I've finished Baby Quilt #4. Brought it up to my parents' house (invited for turkey dinner on Friday night!) and finished the binding while we all watched Dr. No. Well, the terrorists in Boston, of course, as well as the tragedy in Texas. I rarely comment on things like that. At the risk of appearing shallow and unaware of things in the bigger world, I view this (blog) as a place to talk about our family, primarily, and prefer to leave the news to the reporters. Still, our hearts are heavy. Then, more personally, a family I've known since I was about Gunnar's age lost their 26-year-old son this week. I don't know just what happened, but he's in the military and was training for swimming long distances underwater and drowned. Heartbreaking. Yes, the family are all believers, so pray for them, okay? Wyatt is disappointed in the weather - an abundance of rain - which has delayed the start of his new job... his first "real" job. And by real, I mean an hourly (minimum) wage, and a W-2 form. He'll be working at the gate at the local motocross one afternoon a week, and through the summer. 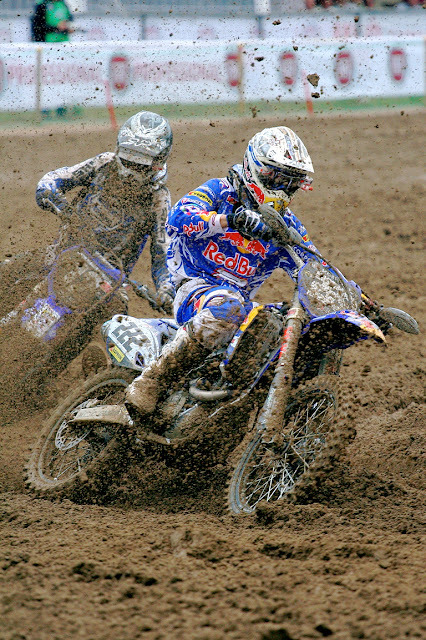 When there's too much mud for motocross, there's just too much mud. I'm coming down with a cold. And I was tempted to list that in the Bad category, because Of Course. But given the events of the week, it just didn't stack up. Still, colds in the spring are just so wrong. Have a cold in the winter, when you can curl up with hot tea and a good book. But in the spring? It seems unjust. * all to the accompaniment of an older and very stoic Scandinavian gentleman playing folk songs on his accordian, (with a little machine at his feet to provide the Boom-Chicka beat)? I mean, that right there was worth the seven bucks! Yes, flying actual airplanes. And possibly even soloing. Often, when Tate comes into a room to talk with me, he will announce himself. It is I, the goat. Pondering... how to organize the rest of the week. Thankful... the boys are so looking forward to their trip to Disney and I'm thankful their wonderful grandparents are providing something so fun for them (when we couldn't manage it, right now). Creating... working on baby quilt #4, but can't show you yet. Going... to help Gunnar with his science and then go for a walk. Reading... Lynn Austin's While We're Far Apart. In the kitchen... lacking inspiration. Maybe taco salad? 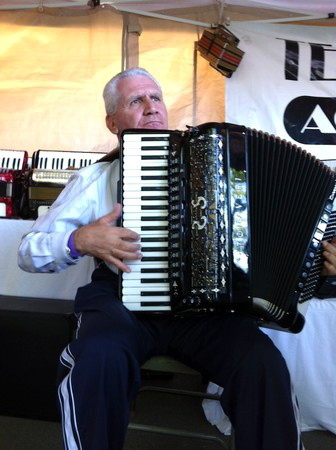 Always a crowd pleaser. Around the house... Gunnar's Geo-mags are in the living room, since he plays quietly with them while we read (and Tate draws). Dishes are piled in the sink, since I ran to the grocery store at lunch time. And my office always looks cluttery when I'm sewing, but it's really not too bad. The Mother Load... Gunnar and I are about to head out for a walk, and I really need to stay on top of our calendar - lots of activities coming up. 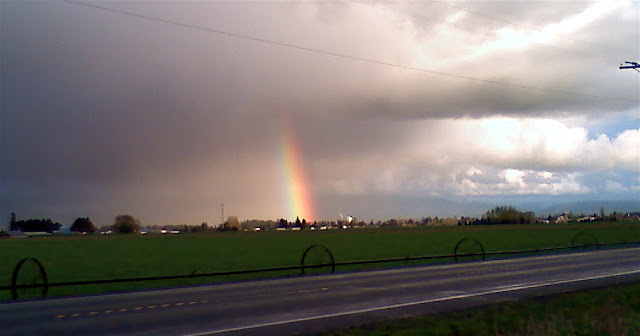 Noticing that... spring weather is CHANGEABLE. Sunny one moment and thunder the next. Go figure! Something fun to share... 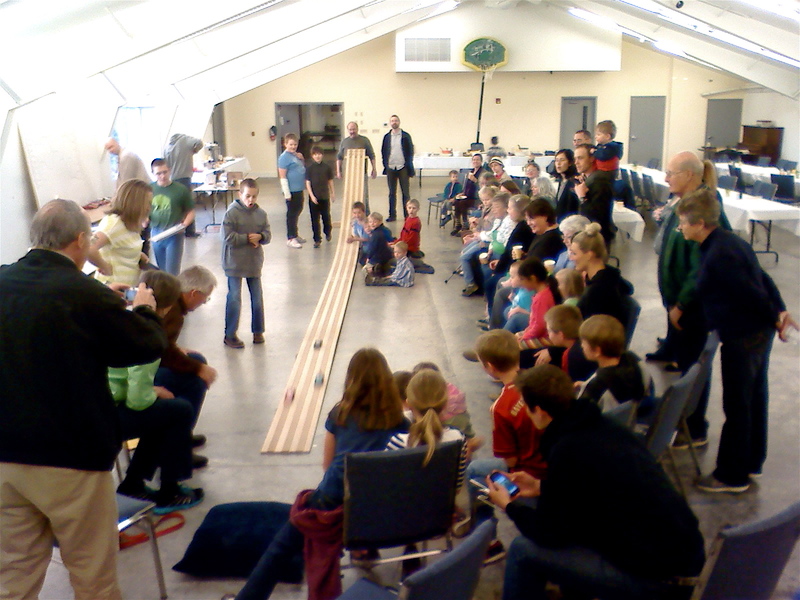 I know, I posted this yesterday with the other Pinewood Derby pics, but I love it. The boys saw it and immediately popped out with a Billy Crystal hellooooooo. A favorite quote for today... Light travels faster than sound, which is why some people appear bright until you hear them speak. A few plans for the rest of the week... homeschooling, orthodontist, meeting at the school, wedding shower, job orientation (Wyatt), CAP, and probably more I'm forgetting. A peek into my world... yes, it's spring, and yes, that's snow. Good news. The suspense is over. FYI, because I'm apparently a huge party pooper (who didn't want to take her good camera into a room full of hyped up kids), I snapped some pics of the boys "cars" before we left home, and the rest are from Kerry's cel. Tate went for irony with the ubiquitous and ultra-slow Pacific Northwest gastropod, the slug, complete with slime trail. Gunnar also crafted something unexpected, inspired perhaps by The Hunt for Red October. And Wyatt, enamored by the British show Top Gear, built this Lancia. Though he also brought along his bus (from last year) so he could see which one was faster. Guesses? 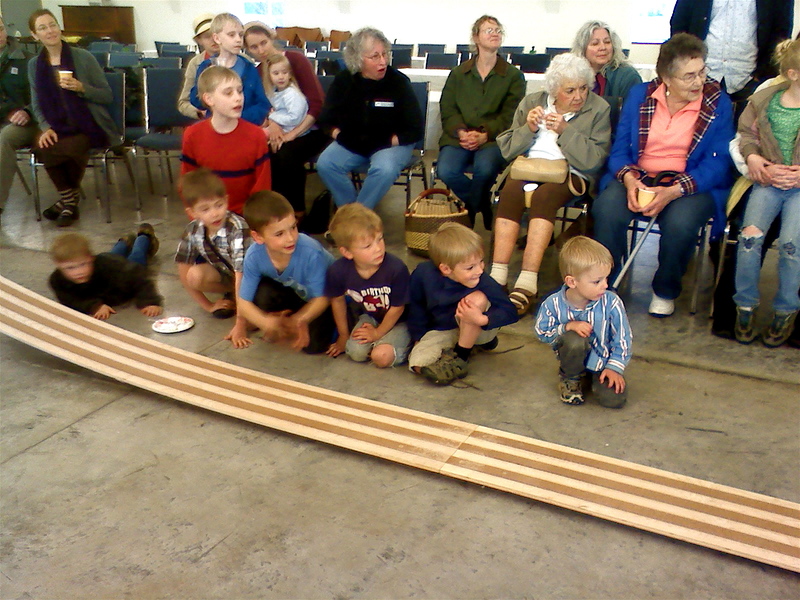 Let's just say he proved my theory that in pinewood derby races, going for speed is a complete crapshoot, so you might as well aim for entertainment. Tate's slug was, well... sluggish, and didn't win a single race. 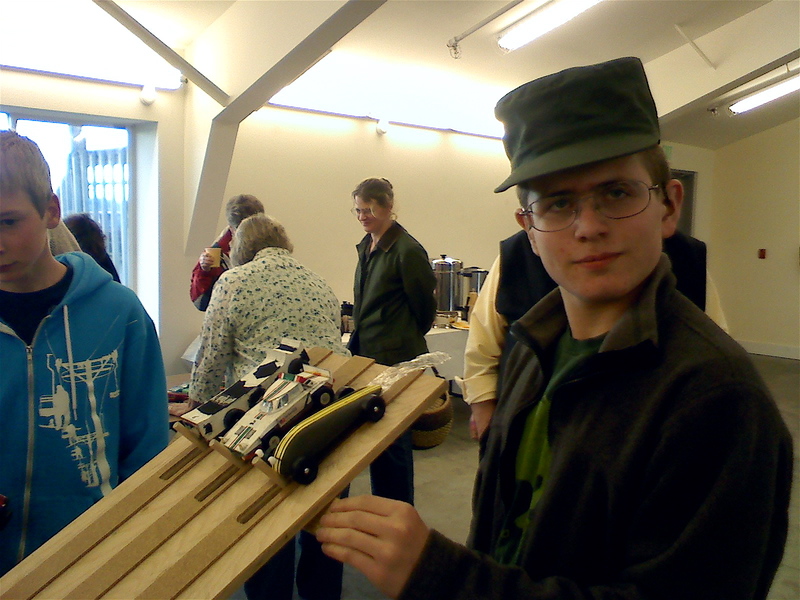 Wyatt's sports car did slightly better, while Gunnar's submarine advanced further through the brackets than either of his brothers' vehicles, but still ultimately lost. What I didn't love, (and here I'll sound like the Grinch...) was the noise, noise, noise, noise! See all those hard surfaces, for sound to bounce off? And all those excited kids, cheering and shrieking? But it was all good fun, if a bit of an ear-bashing. Somehow we didn't get a photo of the little girl who took first place (good job, Adia!) or her older brother in third (way to go, Steele! 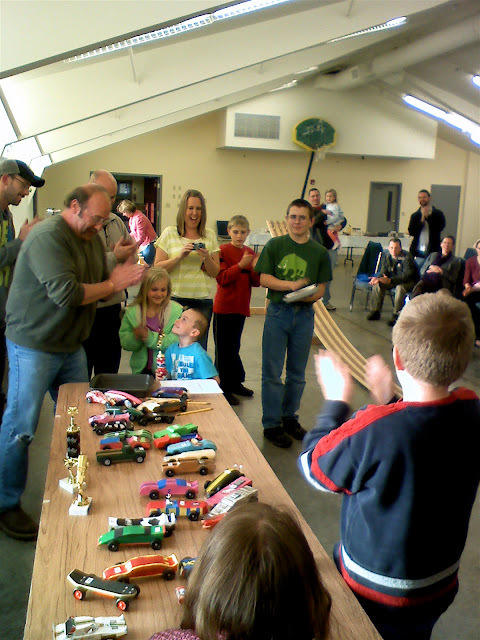 ), but Kerry snapped this pic of Jackson (2nd place) getting his trophy :D I love that the littlest kids won all the speed trophies :D And everyone was a good sport. We didn't come home empty handed. 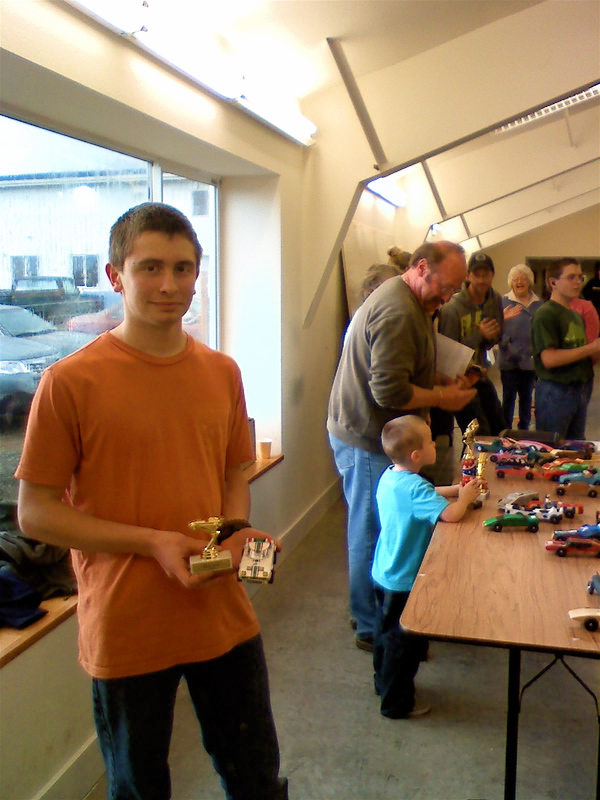 Wyatt's Lancia took the "Best In Show" trophy - he put a lot of work into the details. Also like last year, there was a pretty good show going on outside as we all headed home. The man-made camera can never capture what your God-made eyes can see... although it was only a small arc of a rainbow, this was one of the brightest and most vivid I've ever seen. ,,, and I'm a flower, with nothing interesting to say. But spring is in the air, right? Well, something's in the air, anyway. It's a calm Saturday morning. 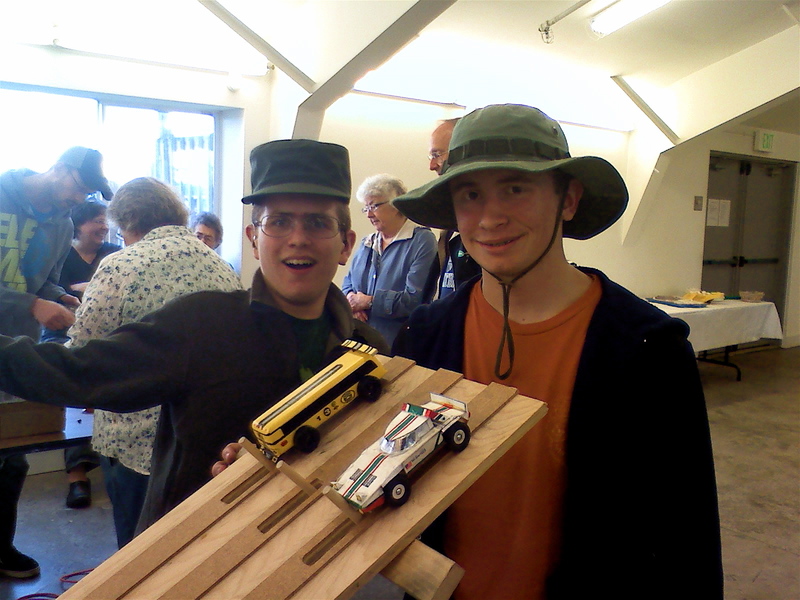 The boys are in the garage, putting the finishing touches on their assorted vehicles for the race tonight (all-church Pinewood Derby - pictures later.) And I'm upstairs, happily cutting fabric into little pieces, so I can sew it back together (aka quilting), and I'm feeling so happy and cozy, maybe I'll make myself a cup of tea. And, lo, movement out the window caught my eye. Yes, my friends, it is Day 25 of Spring, and that would be snow. I woke up to the sound of the wind whooshing around the house and rain spattering on the windows. Ahhh, spring in the northwest. Rain on the schoolroom window. Gunnar and I have been faithfully getting out walking most days, and boy-oh-boy it was good to get out of the house and clear my head today. 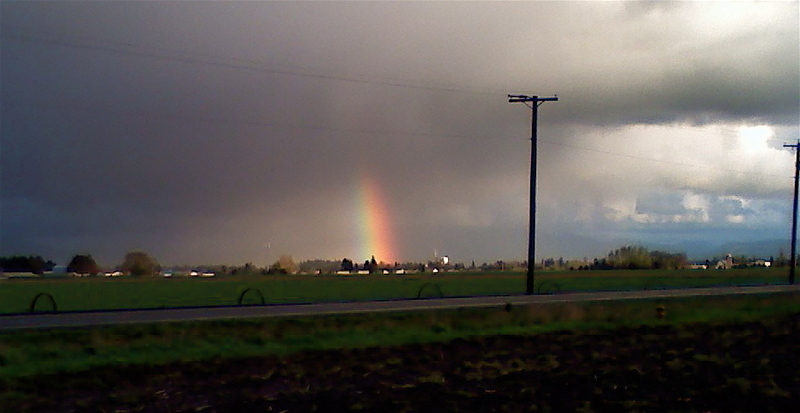 Even better - the sun peeked out for a bit. The backyard, sans trampoline (yay!) and briefly sunny. Don't be overly optimistic by the amount of blue sky you see there. It lasted about ten minutes. In the neighbor's yard - some kind of forget-me-not? What is it about BOYS??? Just when I think they're on track they'll do something that makes me consider beating my head against the wall. We've been having some blustery days inside the house, as well as out. Japanese knotweed a neighbor is NOT controlling. Ugh. Spreads to our yard. Double ugh. Specifically, Wyatt, who is struggling with organization in one of his classes. Frankly, I think the teacher has the same struggle, and his haphazard method of assigning and collecting work is exacerbating Wyatt's issues. Gunnar started calling this "caterpillar plant" when he was little. I'm tempted to dig up a start - it's in the alley. And then there's the distraction factor, related to "classroom management" (ie making kids behave). Wyatt has been complaining from the first week that other students are talking in class, texting, and gaming on their phones, under their desks, making it difficult for him to concentrate. Then the kids are supposed to work together on classwork, and the ding-dongs pester the kids who were attentive, to help them with their work. Sheesh. A tulip tree, at least that's what we call it. It's a kind of magnolia. We're watching a house go up. And - NO - I'm not blaming the teacher for Wyatt's failings. He needs to raise his game. sun reflecting off a puddle on the floor. But when he's getting straight As in his other classes, and even getting As and Bs on his tests (in the class in question), you can see why I want to get to the bottom of why he's getting Ds (and even Fs) on assignments from this class. But then today his math teacher (a different class) pulled him aside to encourage and challenge him. He's doing so well in algebra that the teacher suggested that he double up on second year algebra and geometry next year. but we like them anyway. Meanwhile, on the homefront, he and Tate decided to torment Gunanr by poking holes in some of the pictures on his bulletin board that were very special to him. Gunnar was in tears. I fined them both five dollars (payable to Gunnar) for destroying his property. And when they went upstairs to get the money (and I'm skipping over the ridiculous and agonizing several minutes of arguing with me about it) they decided to poke more holes. And got fined again. Gunnar's friend was waiting for a treat. And on top of that, Wyatt has been getting behind on his homeschool work, and been deceptive about it, to me. So he is on house arrest and is reduced to working from a hyper-detailed checklist. Meaning, he comes home from school in the morning and goes straight to his room and starts working his way down the list. Until I sign off each and every item he stays in his room working, except for meals, bathroom breaks, and a 15-20 minute ride-your-bike-around-the-neighborhood break, mid-afternoon. Mm, mm, mmm... skunk cabbage. Then, to put the icing on the cake, he neglected one of the items on the list yesterday, which was to leave the desk clean. Tate uses it in the morning (while Wyatt is at school) and Wyatt uses it in the afternoon, and typically leaves his stuff cluttering it up. Not fair to Tate. So I put it on his list, to remind him to be considerate. Licorice ferns, growing in the moss on a maple. The rhizomes are edible and (kind of) sweet. I calmly picked it all up and put everything in a box. ... I sold it back to him. Our enemy... stinging nettles, coming up in abundance. Oh, I gave him grace. I only charged him a buck. More moss, more licorice fern. we saw a large, pileated woodpecker on our last walk. He's pretty good with math. I think he got the message. Lacy hemlock branches in the sun. So, you know... fun times. And look what Mr. Sharp-eyes spotted... another one! So, I put this all out there, not to humiliate Wyatt. We've all had our stupid moments. I'm expecting he'll pull through this, and come out better. We don't have it all together. Vinca minor, commonly known as periwinkle. Because sometimes, with blogs, we only post the good things. Or at least, the funny things. Or we only post the hard things when we've come out on the other side, and wrenched a lesson out it. And we look pretty darn special. Gunnar loves this ornamental tree in someone's yard. And really, we're pretty darn ordinary.